It’s hard to believe that simple noodles could be so satisfying. But these, well, these noodles are beyond belief. 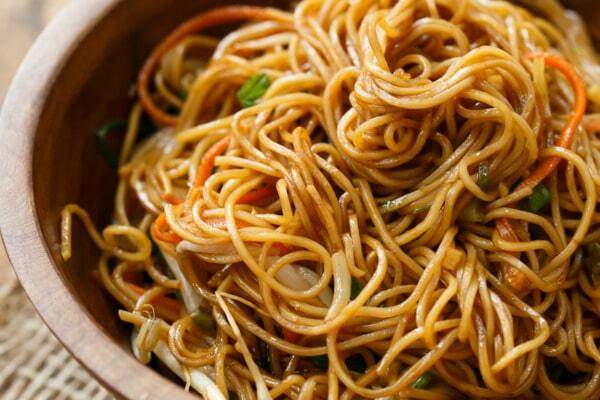 Technically, these are pretty close to what you’d call chow mein. 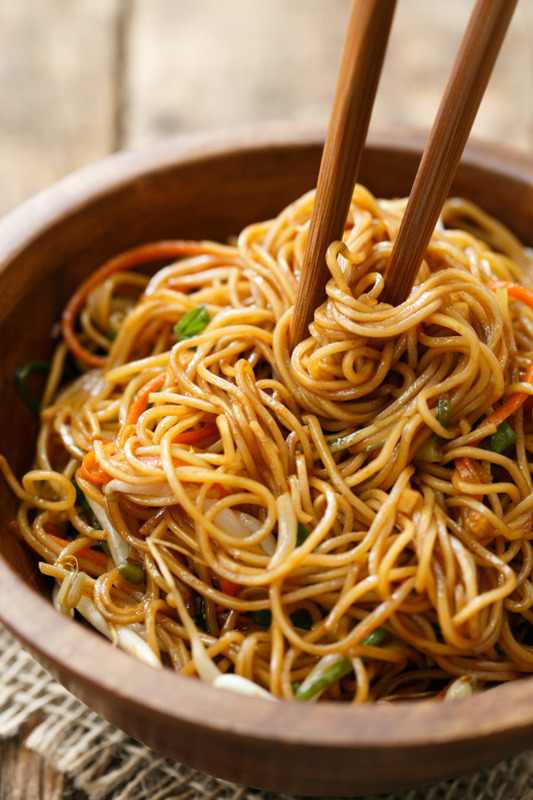 Not to be confused with lo mein, which are usually thicker noodles and tossed with sauce rather than pan-fried. 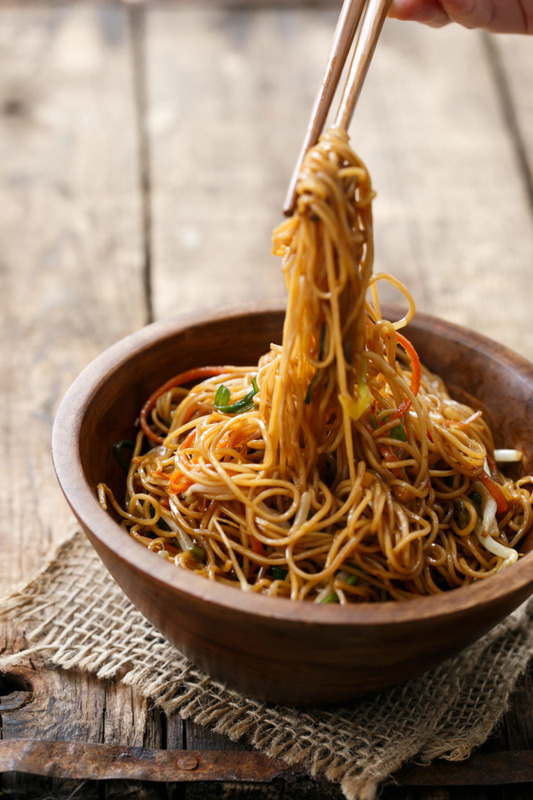 While chow mein has roots in Cantonese cuisine, like many other dishes it has adapted and evolved depending on the surrounding cultures and available ingredients. I am making no claims whatsoever as to this recipe’s level of authenticity, but I can tell you one thing: you can bet your bottom it’s delicious. 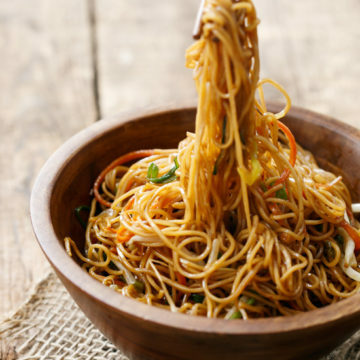 The thin egg noodles (Hong Kong style) are stir fried in a hot pan or wok to varying levels of crispness (fry them longer if you like more crunch), and then tossed with a sweet and savory soy-based sauce that coats the noodles, transforming them from pale, lifeless yellow to a rich glowing amber. Crunchy bean sprouts, green onions, and carrot finish off the dish with added texture, flavor, and color. Trust me when I say the bean sprouts are NOT optional; we left them out once when they were sold out at the store and the dish just wasn’t the same (in short, I should have made something else instead). We tweaked the recipe a bit to our own tastes, adding a bit of dark brown sugar, sesame oil, sriracha, and garlic, as well as shredded carrot to round out the vegetable portion. Taylor even drizzled a bit more dark soy sauce on top (dark soy sauce being his new favorite thing this side of DisneyWorld). 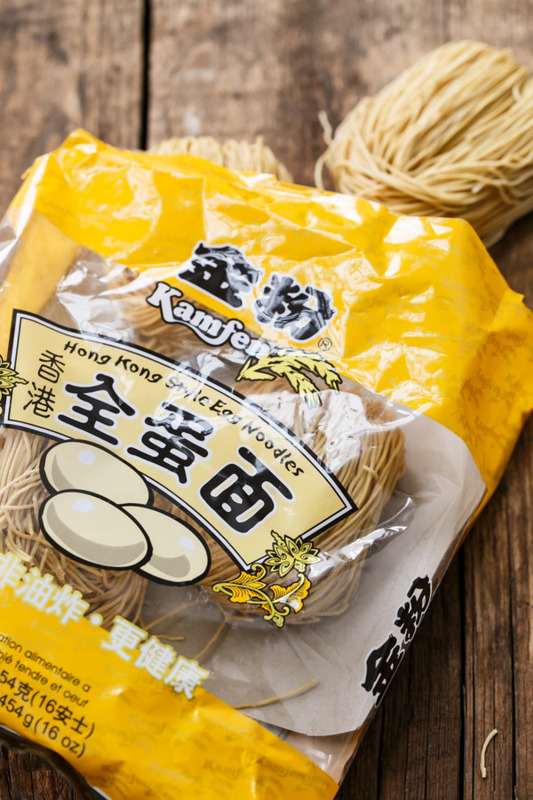 I found these Hong Kong-Style Egg Noodles at World Market. Not to be confused with Hong Kong-Style wonton noodles, which are (apparently) a different thing entirely. And you know what, in a pinch, I really think you could get away with using spaghetti or even angel hair pasta here. Some may cringe at the thought, but really? They are both little more than egg, flour, and water. Spaghetti might be a tiny bit thicker, but I don’t think the recipe would suffer in the least from such a substitution. And if you’re looking for a low-carb/gluten free option, I’ve got a variation on this recipe using spiralized sweet potato noodles just for you! You could certainly also add some stir fried chicken or beef, or even some thinly sliced tofu to round out this dish and make it more of a main dish instead of a side. As it is now, I am perfectly content devouring an entire bowl of succulent, savory noodles and calling it dinner, but I know some people need a bit more, ahem, substance (ie: protein). In which case, add some meat and this dish will most definitely not suffer. Meanwhile I’ll be crouched in the corner eating ALL THE CARBS. 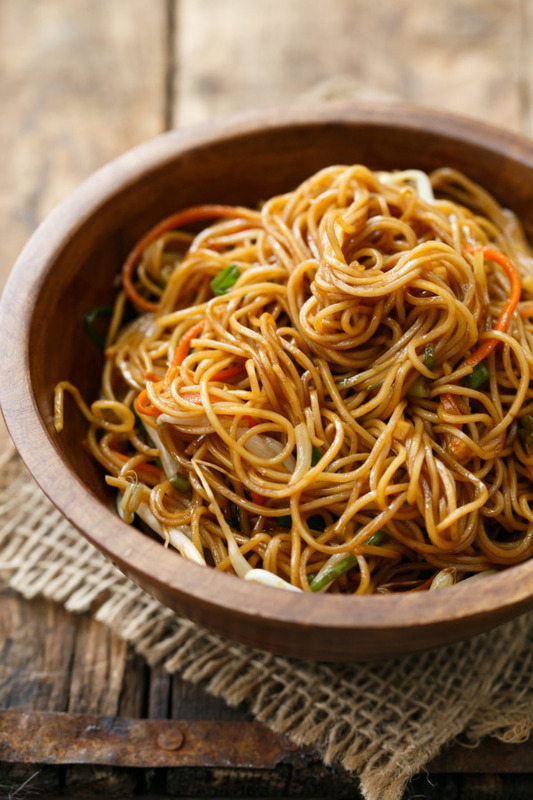 Thin egg noodles stir fried until just crisp, and then tossed with a sweet and savory soy-based sauce, crunchy bean sprouts, green onions, and carrot. In a small bowl, whisk together soy sauce, dark soy sauce, Shaoxing wine, sesame oil, sugar, and sriracha. Set aside. Bring a large pot of water to a boil. Add noodles and cook for 2 to 3 minutes or until tender. Drain and rinse under cool water. In a large skillet or wok, heat 1 tablespoon vegetable oil over medium-high until it shimmers. Add noodles and cook for 2-3 minutes, without stirring, until bottoms are slightly browned. Flip over as best you can and let cook for another 2 minutes. (Even though the noodles will not get entirely crispy, this step helps dry them out so they do not stick and absorb all the flavorful sauce.) Slide noodles onto a plate and set aside temporarily. Return skillet to medium-high heat with remaining 1 tablespoon oil. Add garlic along with white and light green parts of green onion and quickly sautée until fragrant, about 30 seconds. Return noodles to skillet along with soy sauce mixture. 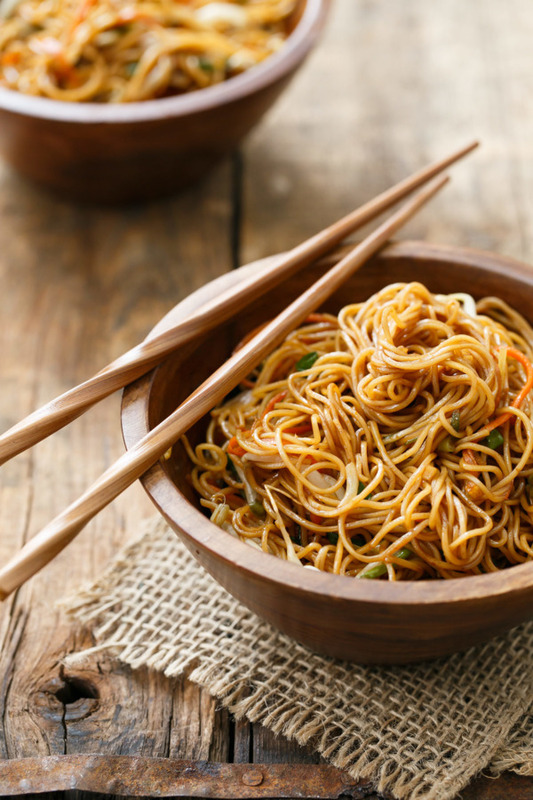 Toss well with a pair of tongs or chopsticks, breaking up clumps of noodles as you go, until noodles are entirely coated, about 2 to 3 minutes. Add dark green parts of green onion, carrot ribbons, and bean sprouts and cook for 1 minute more or until just softened. Remove from heat and divide among bowls; serve immediately. **Beansprouts are often available at stores with good product sections or Asian markets. Note that they do go bad very quickly, so it is recommended to use them up within a day or two of purchase. Adapted from The Woks of Life.